Sylvain White's big comic book adaptation of The Losers has been shooting in Puerto Rico for the last few months. It's one of a few comic book adaptations coming up next year that I'm looking forward to quite a bit, namely because the cast is so awesome. Thanks to Idris Elba's Twitter (via Collider), we now have our very first unofficial look at five of the Losers in costume on the set in Puerto Rico. 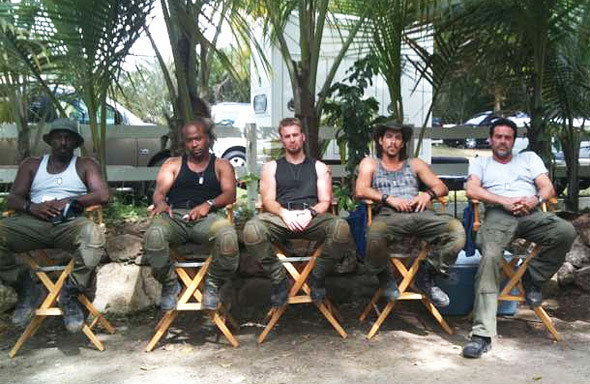 From left to right, you'll see: Idris Elba, Columbus Short, Chris Evans, Oscar Jaenada, and Jeffrey Dean Morgan. Sure it's not much, but I think this looks cool, and I'm already getting excited for this just seeing basic shots like this. Take a look! Originally a Special Forces team seconded to the CIA in the 90s, the Losers were betrayed by their handler, Max, and left for dead following the conclusion of their operation. Eager for revenge and the opportunity to remove their names from a secret CIA death list, the Losers regroup and conduct covert operations against the CIA and its interests, uncovering startling operations spearheaded by the enigmatic villain Max, whose influence within the CIA and US government is unparalleled. The Losers is directed by Sylvain White and will hit theaters on April 16th, 2010 next year. Stay tuned for more updates, photos, and maybe a trailer. The comic is what the A-Team should have been. So if the movie follows the comic (God I hope it does) then it will be GREAT!!! Jason Patric is the reason to see this one. I can't wait to see what he does with MAX. I read the topic/headline incorrectly, as if Puerto Rico is the name of the film, and the cast are losers. "First Full Photo of the losers cast in Puerto Rico." would someone please tell me where the heck aisha is?